Ornamental and simple, the swirls in this design are line drawn with glitter for a soft finish. Grey and silver colours. With its textured surface, this wallpaper is easy to hang and provides a tactile finish. Due to its moisture resistance, this wallpaper is suitable for most rooms including kitchens and bathrooms. Each roll is 11yds x 20.5" and covers 56 sq. ft.
A pointillist diamond design in real flock gives walls an upholstered look and adds decadence to your space. The white flock on a silvery pearlescent background is richly decadent yet still subtle enough for a neutral decor. This wallpaper uses paste-the-wall technology, so it's quicker and easier to hang and is less messy. Experience the sophistication and personality wallpaper adds to your dicor. This stylish geometric design in white and silver has metallic highlights that reflect light back into the room creating a feeling of space. Enjoy world class dicor by globally recognized interior designer Kelly Hoppen. This wallpaper makes decorating quick and easy - just paste the wall and hang the paper and remove it in full strips when you're ready for a change. This subtle geometric design in contrasting white and silver adds style to your space. Experience the sophistication and personality wallpaper adds to your dicor without the hassle. This wallpaper makes decorating quick and easy - just paste the wall and hang the paper and remove it in full strips when you're ready for a change. A super textured expanded vinyl wallpaper with a modern damask design. This paper is in a contemporary duck egg blue with silver metallic highlights and a shimmering white pearlescent background with a textured finish. Perfect for covering up minor wall imperfections and blemishes as the 3 dimensional finish helps to disguise lumps and bumps. Use alone on all 4 walls, or as a feature wall. 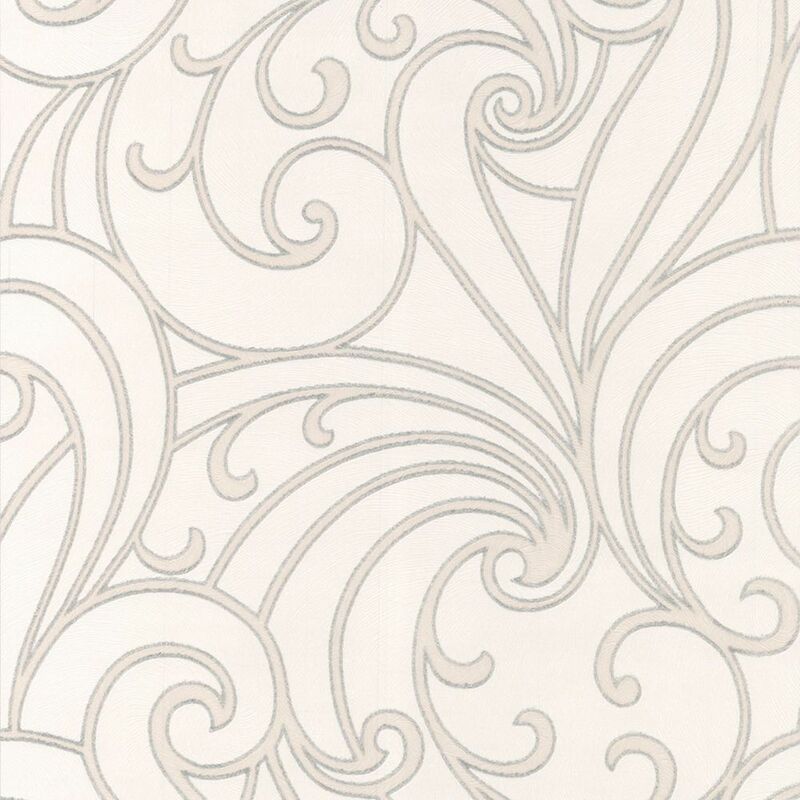 Saville Grey/Silver Wallpaper Ornamental and simple, the swirls in this design are line drawn with glitter for a soft finish. Grey and silver colours. With its textured surface, this wallpaper is easy to hang and provides a tactile finish. Due to its moisture resistance, this wallpaper is suitable for most rooms including kitchens and bathrooms. Saville Grey/Silver Wallpaper is rated 5.0 out of 5 by 2.